This is the fifth consecutive year China Water Risk has taken part in World Water Week in Stockholm. As with previous years the conference was very well attended with over 3,600 participants from 133 countries. This year the theme was “Water, ecosystems and human development” and many events centred around nature-based solutions. Our event this year was titled “Asia Water-nomics: More GDP with Less Water & Pollution”, the seminar covered the following topics. More details can be found here and here. Does Asia have enough water for its people and future development? Will climate change exacerbate current water constraints across Asia’s 10 river basins? What is China doing in balancing water and development? What can we learn from the Yangtze River Economic Belt (>42% of national GDP)? At the city level, what can we improve in water management? Are sponge cities the future urban ecosystem? What implications are there for sectors e.g. electronics? In previous years we have noted that the need for business and finance involvement has become more and more present. This year was no exception, as it seems to now be common knowledge that business and finance have a key role in achieving SDG6. Just to give an example, the room that the seminar “Blended finance: From principles to practice” was held in was completely jam packed with attendees, to the extent that many were not able to enter. Later on, one of the audience members remarked to the panel that “2-3 years ago, such an event would only attract a handful of people”. While this is encouraging, the presence of mainstream investors and bankers is still somewhat lacking if we are to fully connect finance with SDG6. As for business, leading corporates were again on hand to share their water strategies and stewardship plans. Food & beverage and textile brands were particularly active, with Nestle, Danone and H&M all showcasing their actions on water. More positively, tools and solutions to help corporates pursue water stewardship also seem to be improving, from the new Water Stewardship Benefit Accounting Methodology to the revamped Water Risk Filter by WWF. That being said, representatives from some leading brands were quick to point out that while they were moving forward with water stewardship actions, there needs to be more collective action within sectors. This point was particularly stressed by a speaker from Alliance for Water Stewardship in the seminar “Water stewardship benefit accounting: New approaches and lessons learned”, who said “it cannot always be the same people doing the heavy lifting”. Data sharing among companies over water stewardship was recommended along with tangible corporate water metrics that can be comparable between companies. Elsewhere, in the seminar “Water stewardship: Partnership and financing models for scale”, roundtable participants concluded that it would be more efficient if brands stopped “doing their own thing” on water and signed up to basin-wide water stewardship initiatives. Properly valuing water and its associated economic, social and cultural benefits is key to bringing business and finance to the table. This conversation was already in progress in 2016 and this year efforts were stepped up significantly. The UN High Level Panel on Water, for instance, convened multiple seminars to promote the Valuing Water Initiative. Concrete successful examples of valuing water and subsequent actions on the ground in Columbia, the Philippines and more were presented. Q&A sessions however, showed that some of the audiences were still skeptical on the usefulness of the concept. Some pointed out that similar initiatives have had little impact at a wide scale while others were uncertain as to how material this value can be to financial institutions and businesses. Nevertheless, the Valuing Water Initiative appears to be gathering steam with Henk Ovink, the first ever Special Envoy for International Water Affairs, as a champion and various organisations signing on. When speakers and panelists were asked what more was needed for better on ground projects and larger finance and business participation, governance was brought up most of the time. For example, during the “Water sensitive and livable green cities in Asia” seminar, one of the speakers believed that stronger decentralised governance is key to tackling India’s groundwater issues. Similarly, another speaker from the ADB working on the Secondary Green Cities Development Project in Vietnam saw continued engagement with government officials as essential to the success of the project. Elsewhere, roundtable discussions at seminars like “Innovative financing to protect ecosystems in Asia” and “Accountability for scaling market based sanitation financing” stressed that strong governance and political will on water from the top down can help lend credibility to projects and catalyse more finance and business involvement. Despite this, we observed that the number of policymakers at Stockholm seems to be declining in recent years and hope this can be reversed next year. We were also pleasantly to see the high rate of youth involvement in seminars, showcases and exhibitions alike. For instance, all the presenters at the seminar “Can Valuing Water change our attitude towards water? Concrete examples!” were under the age of 35. We were also introduced to the impressive work being done by organisations such as Water Youth Network and World Youth Parliament for Water. It was also noted at the closing plenary that “future leaders make their mark at World Water Week”. With many of our current water problems likely to exacerbate in the future, it was certainly encouraging to hear the voices of the future generation at high level discussions. Inclusivity in water will likely further improve next year with the theme being “Leaving No One Behind”. We are already looking forward to it! Born in Hong Kong, Woody graduated from the University of Cambridge in June 2016 with a BA in Geography. His travels across Eurasia pointed him towards the nexus between environmental risk and global business. In particular, he is concerned with the extent and effects of wastewater discharge in China – the topic of his dissertation. 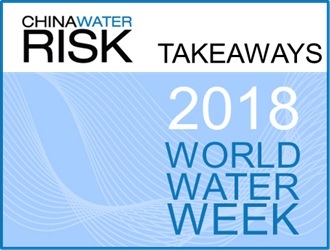 At China Water Risk, Woody undertakes multiple research streams ranging from water stress in the HKH region to water issues in China’s mining and data centre industries. Moreover, he assists in the publication of the monthly newsletter and will be responsible for future updating and revamping of China Water Risk’s website. Also proficient at GIS mapping, he hopes to embark on a career which helps tackle climate change from a business and financial perspective. No Water, No Growth – Does Asia Have Enough Water To Develop?